Teenagers these days are pretty hard to impress. With easy access to instant on-line entertainment and their inherent immediate gratification attitude, it’s difficult to know what (if anything) will “wow” them. 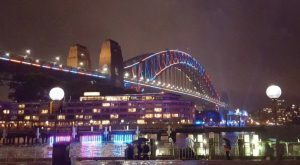 How about Sydney during the Vivid Festival? 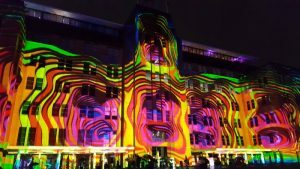 Sydney’s 2017 Vivid festival is from May 26 – June 17. 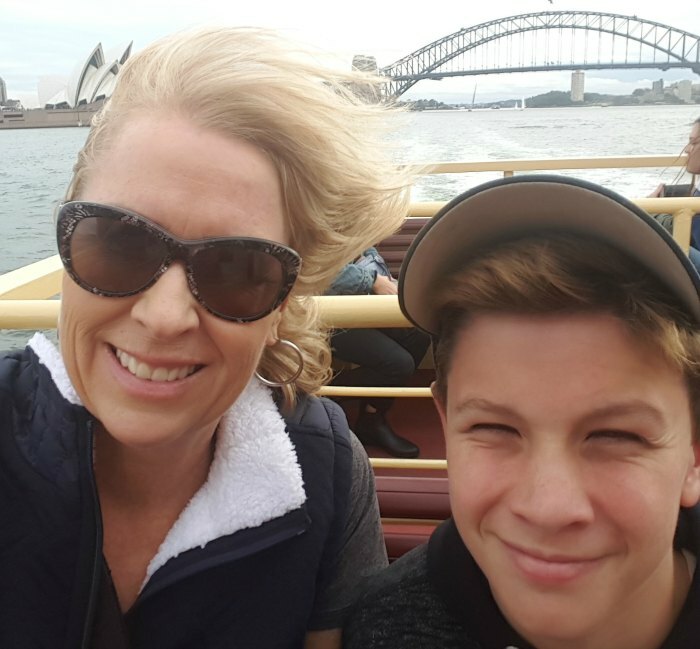 Last weekend I travelled to Sydney with one of my twins – Mr 13 year-old. I thought what better time to introduce a child for their very first visit to the harbour city, than during the Vivid Festival? 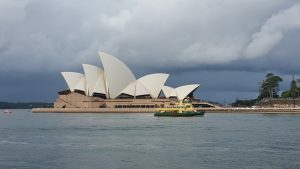 Usually I visit Sydney as a solo traveller, but on this occasion, I’m encountering Sydney through the eyes of my 13 year-old. Did we find the “wow” factor? Catching the train from the airport into the city is easy, especially with an Opal card. Purchased at the airport’s train ticket office, for the remainder of the weekend, we simply “tapped” on and off trains and ferries. Twenty minutes later at the Circular Quay stop, through the train window we spied our first tourist icon – the Sydney Harbour bridge. Mr 13 was pretty excited (and so was I.) That iconic bridge stirs the travel bug within! We hopped off at Town Hall station and ambled along George Street to our home for the next few nights, The Hilton Hotel, chosen for its convenient location (an easy walk to many of the Vivid attractions) and guaranteed comfort. Bags were dropped into our room (thank-you Hilton for the upgraded room to the 42nd floor with great views of the Centre Point Tower) and off we went to explore Circular Quay, the Harbour and Rocks area. 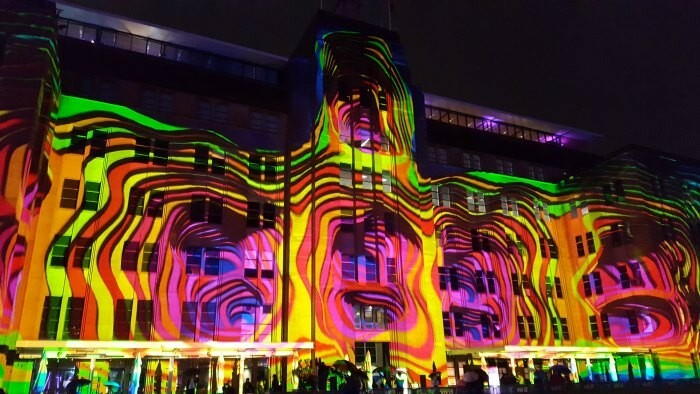 We passed many of the shapes and structures set up for Vivid – ready to take on a whole different look as night falls. It’s evening and we’ve wandered to Sydney harbour. The iconic Harbour Bridge a shining beacon to our left, is draped in lights. Despite the light rain, the crowds are out enjoying the experience. Although Customs House is undergoing building works, the façade is transformed by iridescent colours flowing across the surface. 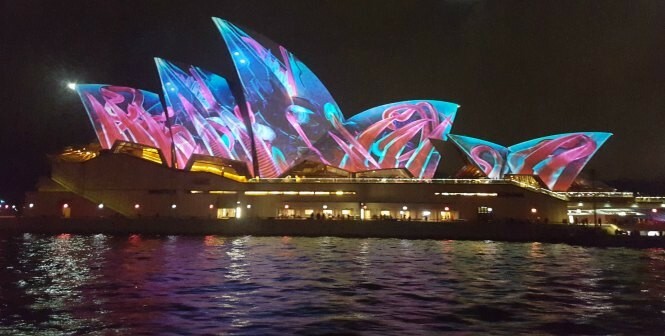 Standing in front of the Museum of Contemporary Art, we’re mesmerised by the Opera House, its massive sails now a canvas displaying a moving Vivid visual called Audio Creatures. Created by Sydney artist and art director Ash Bollard, imaginary animals consume the sails, disappearing into “blobs” of 3D colour that look like they’re bubbling under an intense heat. 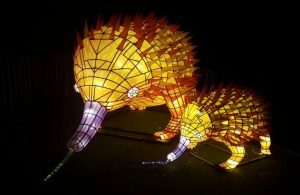 Wait a minute and they explode, changing into another kaleidoscope of brightly coloured images over 15 minutes. The amazing display can be viewed from various locations as you walk past or travel by on the ferry. Photos do not do it justice. 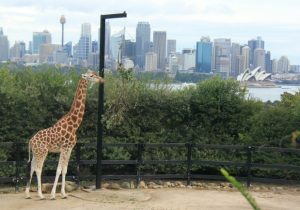 As many times I’ve visited Sydney, I’ve never been to the Taronga Zoo. 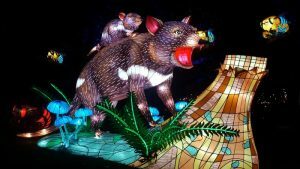 My son wanted to go, so with our Vivid at Taronga Zoo experience – Lights for the Wild, booked for the 7.30pm – 9.30pm session, I purchased same day admission tickets for the zoo. 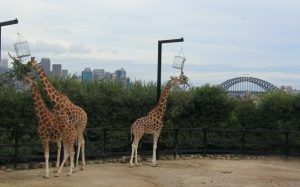 We arrived by ferry mid-afternoon to scurry around the zoo exhibits. I have to be honest, I’m not a massive zoo fan, preferring to see animals not confined to small enclosures. But I can appreciate how zoos bring certain animal experiences close to those unable to travel to the animal’s country of origin. Let’s face it, not many of us (me included) have seen gorillas in the wild. 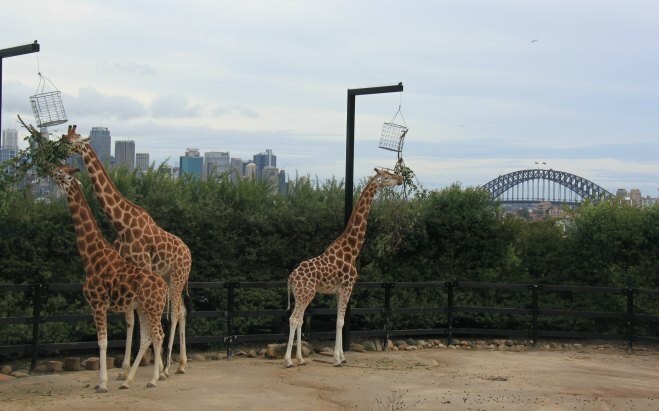 And the classic pic of the giraffes with Sydney’s CBD as a backdrop is impressive. Early evening finds us dashing up Market street and onto the footbridge to Darling Harbour, where we see our next “wow” Vivid experience, the Magicians of the Mist. Massive plumes of water (28 tonnes is propelled into the air every minute) shoot upwards, creating a screen of mist 40 metres high by 60 metres wide. Holograms appear as if by magic and are joined by dazzling laser lights bouncing off the watery canvas. This is all timed perfectly to music. “Based on sci-fi writer Arthur C. Clarke’s Third Law: that any sufficiently advanced technology looks like magic,” is how Ignatius Jones describes it. We fluked an outside table right at the front of the first-floor balcony of Thai Foon restaurant in the Darling Harbour shopping centre. It was the ideal position to enjoy the 7pm fireworks display. A quick dash to the Pyrmont jetty to grab a water ferry to Circular Quay for our Taronga Zoo Vivid experience, proved to be a bad decision as everyone else thought to do this at the same time. The crowds were the thickest we’d experienced all weekend and delayed our arrival at Circular Quay, causing us to narrowly miss a ferry departing for the zoo. Unfortunately, a 40-minute wait for the very last ferry of the night to the Zoo, meant we arrived just after 9pm. We had to race through the Lights for the Wild experience. (They say give yourself two hours – we wished!) 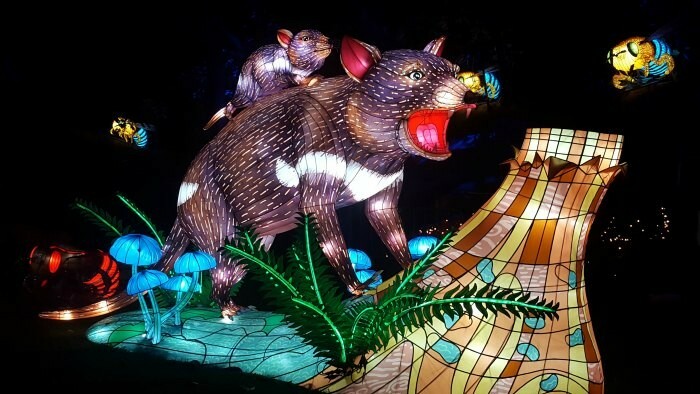 The brilliant creative Vivid creatures on display at the zoo deserved more time. But with the staff warning the exhibit is closing, we couldn’t dawdle. Our weary legs carried us up Pitt Street to our Hotel room as we said good-night to the Vivid festival. 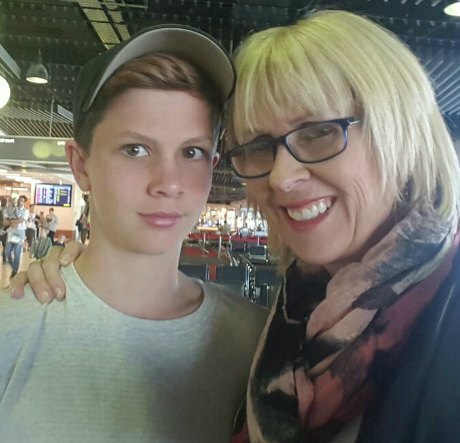 Mr 13 checked his fitbit – 24,000 steps in one day – not a bad effort! On this trip to Sydney as a solo parent, I didn’t have a drink with friends in one of my favourite Sydney bars, nor could I linger luxuriously over breakfast with a magazine, or wander aimlessly up Oxford Street checking out the boutique shops – my usual Sydney week-end activities. No, this visit was about introducing my young man to a few Sydney tourist attractions and gaining an occasional “wow” moment from him. It also involved lots (yes lots) of walking! This trip was also my first foray into walking a distance, since my mid-January mishap on the ski slopes in Japan, where I came home earlier than anticipated with a leg in plaster. We certainly didn’t cover everything on offer in Sydney in one weekend. But we gave it a good nudge and created some special memories. 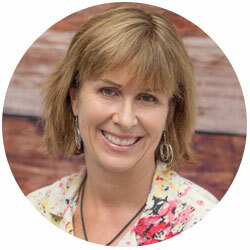 The writer paid for all experiences and accommodation – no sponsorship was received on this trip.